Lisa's Carolina | Handmade: The.....top.....is....DONE! Towa was a big help. Her cuteness is just so.... helpful. 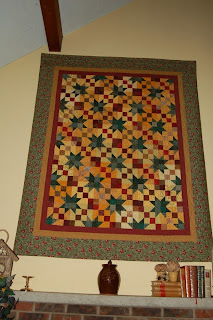 ....than how it photographed on my design wall ..... all pieced and sewn together! Yes! Please tell me you can feel the excitement emanating from my home this afternoon!!! Oh, Lisa, what a BEAUTIFUL piece of work! I know quilting isn't your first love, but you have taken to it with gusto! Nice, nice, nice! You are such a wonderful quilter, your compliments mean a lot! Thank you Mama Pea! You are such a wonderful quilter too Beverly! Thank you so much!